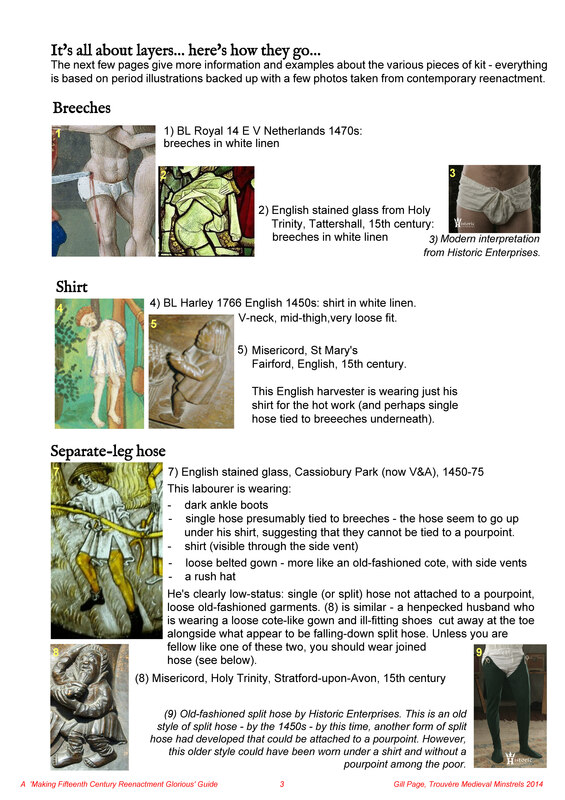 Earlier in the year, I put together some guides on late medieval clothing, as part of the Facebook group ‘Making Fifteenth Century Reenactment Glorious’. The aim of the group is to improve standards in the presentation of ‘Wars of the Roses’ period reenactment and living history, and an important part of this is ensuring beginners get good quality information and don’t waste their time and money on inappropriate kit and equipment. 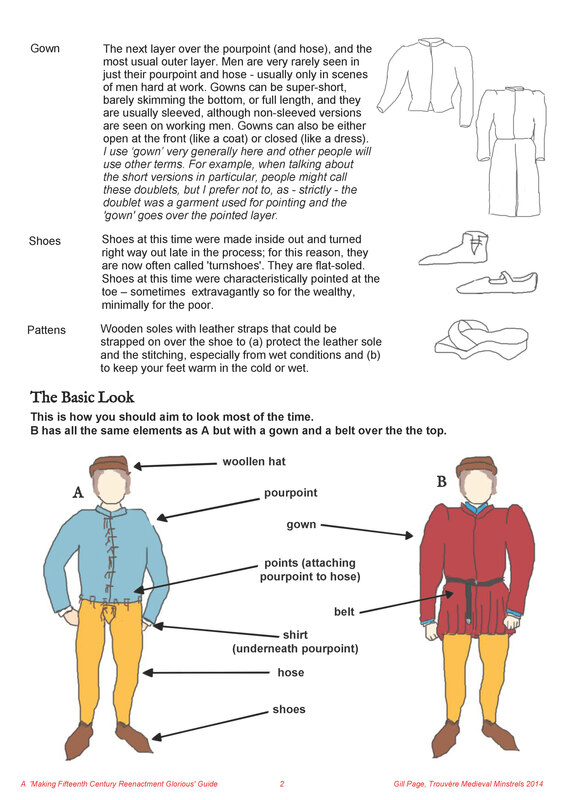 So I took on the task of preparing costume guides for beginners and ended up producing one for men and one for women. They list all the main parts of period kit and are stuffed with period illustrations to back up my sketches as well as photos of people in excellent kit! but it seems a good idea to make them more widely available, so if you would like to use them please feel free – but please acknowledge their origin as follows “by Gill Page, for Making Fifteenth Century Reenactment Glorious“. The guides are intended for beginners setting out to make or acquire kit suitable for late fifteenth-century England – I’ve avoided continental sources as much as possible. 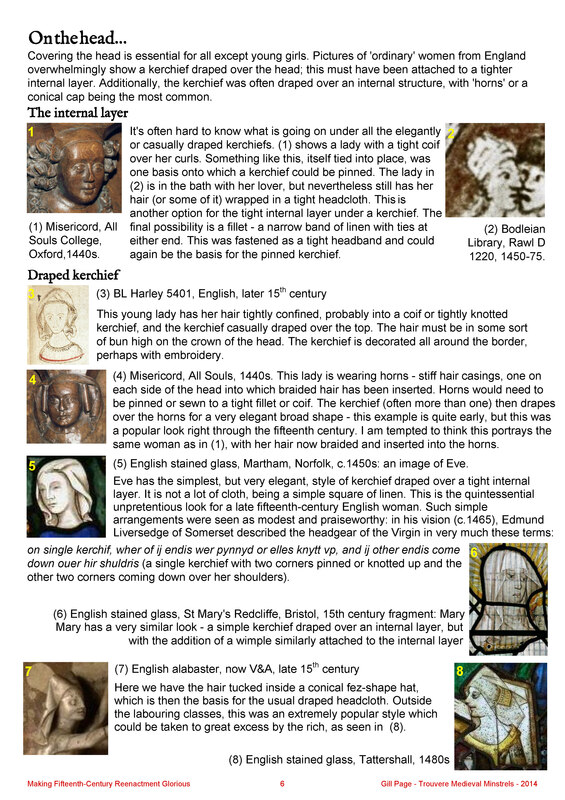 I had great fun searching out English material and was helped enormously by some wonderful online collections of stained glass, misericords, wall paintings, English alabaster… all these are credited in the guides and are well worth a look! This entry was posted in Costume and tagged english history, fifteenth century, living history, medieval, medieval clothing, medieval costume, medieval garb, medieval minstrels, middle ages, reenactment, trouvere, wars of the roses. Bookmark the permalink.